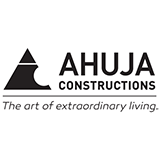 While making the logo, we identified two strong figures that represented Ahuja Constructions – that of a pyramid and a circle. The pyramid took into account the letter “A” of Ahuja and the circular shape on the right side represented the letter “C” for constructions. The shape of the pyramid which stands on a strong base symbolises strength and reliability while the part of the circle represents the essence of perfection. The division at the top of the pyramid not only forms the “A” of Ahuja but also divides the apex from the base, in the same way Ahuja Constructions stands out from the ordinary while still being grounded by our core values. The semi-circle on the bottom right hand side of the also signifies an entrance that welcomes one into an Ahuja Constructions home that is not only built on a strong base but also something that offer one much more. The yellow beam which is generally used with the logo stands for a positive and bright future. Our Tagline is a reflection of our ideology. It underlines our desire to consistently innovate and create homes that are a cut above the ordinary.